As requested, here is the tutorial how to dump il2cpp of iOS Unity games. With Il2CppDumper, it will be much easier to find useful functions and offsets to hack. No need to waste your time debugging the game. It will ask you to select platform, 32-bit or 64-bit. As you used auto mode, the program will tell the pointers, but you do not need to know it if you have no idea what it is. "I have to say, these same questions will make me feel that adding auto feature is a bad decision"
We have to find 2 required offsets (CodeRegistration and MetadataRegistration) in IDA to dump. 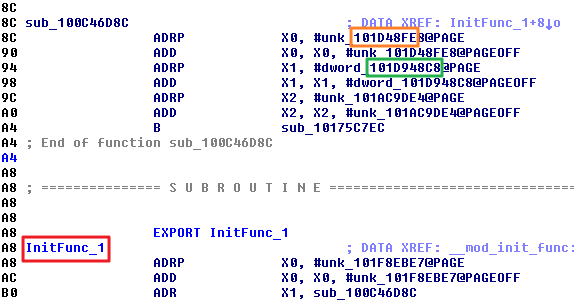 Open IDA Pro 64-bit (idaq64.exe), and disassemble the binary in 64-bit. Search function name InitFunc_1. Above InitFunc_1, there is sub function that contains 2 pointers we need. Inside dump.cs, you'll see C# codes. Method bodies are not dumped but it's a very simple code that tells you function names and offsets to mod. This class body is like a group to make programmers easier to find codes. For example PlayerAntiHack class contains anti-hack code related. A class is a construct that enables you to create your own custom types by grouping together variables of other types, methods and events. A class is like a blueprint. It defines the data and behavior of a type. ... Unlike structs, classes support inheritance, a fundamental characteristic of object-oriented programming. Fields is not what we looking for so let's look into Methods. This is what we looking for. These simple codes explains the name of the methods/functions, what type and the REAL IDA OFFSETS are written in the green commenented text. int, float, double, boolean etc are data type. Write down all useful functions + offsets you found inside the dumped .cs file and start writing your code injection. Note: It is suggested that you disassemble the binary file and look up the offsets to see if there are enough spaces to replace the instructions to hack. That's all. Good luck hacking iOS games!